The potential to save countless lives is just one of the seismic outcomes emerging from a new HIV treatment test developed in South Africa. In producing a prototype which can measure patients’ CD4 counts in under 20 minutes, a team at Rhodes University have also done nothing less than pioneer a new model for innovation itself. Experts say it could serve as the trailblazer for a new breed of postgraduate entrepreneur, and numerous working prototypes and products generated at African universities – possibly starting with a game-changing malaria test strip at the same university. 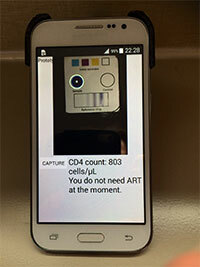 The Colorimetric Aptamer Based Biosensor seeks to solve a critical problem in the developing world, in which patients who test positive for HIV must currently come back to the clinic days or weeks later to get their lab-generated CD4 counts, and possible treatment based on those scores. Some begin their ARV therapies too late; some – faced with travel obstacles - don’t return for their drugs at all. Meanwhile, the costs of follow-up care and lost labor have been calculated in the hundreds of millions of dollars for a country like South Africa. The 20 minute prototype was unveiled in New York in May at the launch of the UNICEF Global Innovation Center, which is collaborating with Rhodes in rolling out new diagnostic tests which dramatically cut costs and time. Grammy award-winning singer Angélique Kidjo was among the dignitaries who attended the UNICEF launch, along with no fewer than seven Old Rhodians working in various capacities within the UN and elsewhere. Comprising a test strip, a bio-recognition agent, a standard smartphone, an app, and 3-D printed case, the prototype – developed by the Biotechnology Innovation Centre at Rhodes – can accurately generate that count within minutes, by analyzing the intensity of a color stain on the test strip. The bio-recognition “aptamer” developed by the team zeroes in on CD4 in the blood. But, for Professor Janice Limson, director of the center, the process of how they developed the prototype could prove just as revolutionary as the unit itself. Where post-doc researchers are generally whisked away from promising projects by the private sector or a research-only mandate in South Africa, the biosensor project will retain dedicated research experts - such as Jan Kruid, who demonstrated the technology in New York, and Lance Ho - on the onward innovation and prototype development phases. 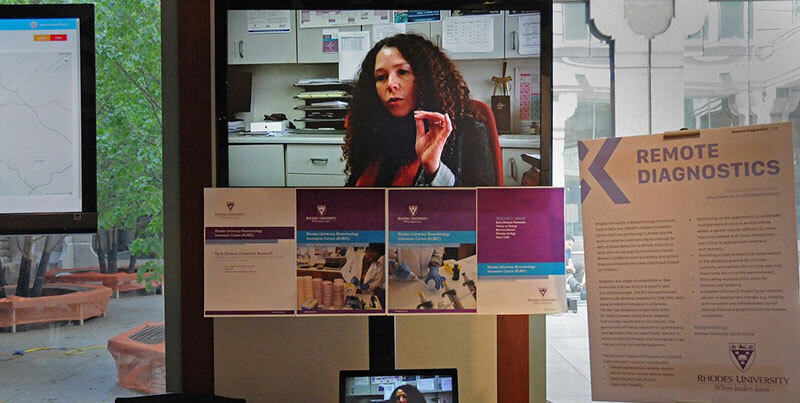 And where research collaboration is generally limited within the same faculty, the CD4 prototype saw talented students being roped in from the computer science and marketing and even journalism faculties to build a complete package. Now, having been awarded a South African Research Chair in Biotechnology Innovation and Engagement by the Department of Science and Technology and the National Research Foundation, Limson will be well positioned to take the “research and innovation” model to all South African research institutions. The biotechnology faculty at Rhodes has already produced notable innovations, including the BioSURE process to address South Africa’s massive acid mine water problem. Here, biotechnology professor Peter Rose was not only able innovate a working solution, but was also able to rapidly upscale the technology. Limson says this kind of innovation helped inspire the formation of a center where innovation is one of the metrics that academics are measured against. “The exciting part is that the university understands that – while we’re still performing the teaching and research functions – we’re no longer going to operate as normal academics do, because we are innovating as well,” she says. Using this model, an inter-disciplinary team of half a dozen students came up with a method in which the color reaction of a drop of blood on the aptamer could be photographed with a smartphone, and its tell-tale color then analyzed. In order to block out all other light, a colleague, Dr Ronen Fogel used a 3-D printer from the suite available at the Centre to create a plastic case, featuring a slot in which the strips can be correctly photographed. In fact, one of the printers was recently donated by UNICEF in Uganda by Dr Sharad Sapra to the 3D printer Makerspace being led by RUBIC staff member Dr. Earl Prinsloo. Limson said bio-recognition agents operate in a similar way to traditional antibody agents in tests, but avoid their high cost. The darker the color blue recorded by the app, the higher the CD4 count. “It was exhilarating; quite a big group effort. Talented students from computer science made the app; we had a student from journalism do the brochure; our students and staff suddenly learned how to do 3-D printing design,” she says. However, she says partnerships are required to address remaining challenges, both for the CD4 test and the new innovation model. In addition to funding, Limson is also hopeful of finding a technology partner in the field of diagnostic test strips to boost the efficiency of the prototype. While the current test sees blood dropped directly on the paper test strips, she says strips, which offer “microfluidic channels” - as seen in typical blood sugar tests for diabetes patients – would enhance the reliability and sensitivity of the results. To find technology partners, Limson hopes to leverage the networking power of new collaborative platforms like CauseTech, which is a partnership between the Chief Marketing Officer (CMO) Council, the Business Performance Innovation (BPI) Network, and UNICEF. CauseTech’s “Succeed Where There’s a Need” campaign invites innovators everywhere to vie for the chance to have their innovation become part of life changing solutions for the world’s most vulnerable children. 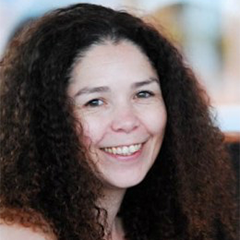 Janice Limson is a Professor of Biotechnology at Rhodes University where she heads the Rhodes University Biotechnology Innovation Centre (RUBIC) and the discipline of Biotechnology. Her research focus is in the area of biosensors (diagnostics) and biofuel cells utilizing nanomaterials. These studies are firmly aimed at societally led innovation in the sector, an overarching goal for postgraduate research at RUBIC. She is at present developing an accredited facility at Rhodes that will support testing and validation of product and processes developed within Biotechnology and aligned disciplines, including Pharmacy. RUBIC launched its first products, catalysts for sensors this year, with sensors for CD4 and malaria currently under development in a partnership with UNICEF and the Medical Research Council. Nationally Prof Limson is engaged in policy making for the new Bioeconomy Strategy for South Africa, serves on the advisory board of the Public Understanding of Biotechnology Programme and is editor of Science in Africa magazine and of the National Nanotechnology Public Engagement e-newsletter. Internationally she has formed a Sensors for Africa network of scientists aiming to collectively work at bringing low cost diagnostics of relevance in Africa towards the forefront of research in the area. She is a former recipient of the National Science and Technical Forum Award for Outstanding Contribution to SET in South Africa, first Runner up in the DST Women in Science (Life Sciences), winner of the Vice-Chancellor’s Distinguished Research Award at Rhodes and twice featured as one of South Africa’s Mail & Guardian’s Young Leaders.